“Pay as you go” campus parking – at last! 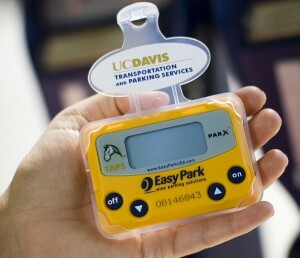 Using the same principle as prepaid credit and phone cards, Transportation and Parking Services (TAPS) now offers handy prepaid parking minutes with the EasyPark Personal Parking Meter (PPM). This small electronic device, available from TAPS, is operated and displayed from the convenience of your car. No swiping required! Just press “ON” when you arrive at a Visitor Lot, C Lot, or metered space and “OFF” when you leave. Your EasyPark costs exactly what a meter charges ($1.50 per hour) up to the daily maximum of a Visitor Parking Pass ($7). The great news is that you pay only for the time you park to the nearest minute. Why invest $7 for a daily visitor parking permit for a quick stop, or leave extra, unused minutes on a campus meter? And no feeding the meter or searching for a Visitor Parking Pass dispenser! TAPS is hoping you’ll find this new parking option cheaper and more convenient. TAPS can get you started with an EasyPark PPM for an initial, returnable deposit of $33 for the electronic device. Add minutes to your PPM in increments of $25 up to a total of $300. There are some restrictions you’ll want to review (such as time limits at metered spaces still apply). Questions? Contact TAPS at 530.752.8277 or read about the EasyPark PPM program on the TAPS website.